It's really great to own different kinds of donabe in different sizes. Not only for 1-serving dish, but also for side dish or izakaya-style dish, I often use mini donabe, too. 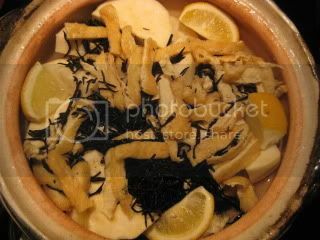 The other night, I made quick donabe stew of Satsuma-imo (Japanese sweet yam), hijiki seaweed, and abura-age. It was great! 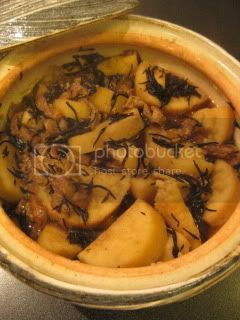 For this dish, I used small-size classic-style donabe, "Hakeme". 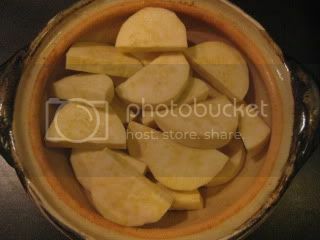 In a small donabe, I first put 1 medium-large satsuma-imo (sliced into 1"-thick), then covered the yam with rehydrated hijiki (1T when it was dry), 1 sliced abura-age (blanched), and 1/2 lemon (cut into wedges). Enough water to cover 2/3 way of the ingredients (about 2C), 3T Okinawa black sugar, and 1T shio-koji (salt-marinated koji, or you can substitute it with 2tsp soy sauce) were added. 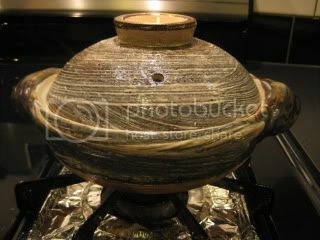 The donabe was covered and set over medium-high heat. Once the broth starts to almost boil, the heat was reduced to simmer and cooked for about 25 minutes, or until the broth was reduced down to very low. 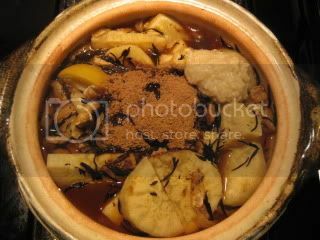 The heat was turned off and the donabe was rested for about 10 minutes. (My mini Hakeme donabe looks so cute!) The dish was served in the donabe right at the table. It was wonderful!